Rijiju said the Central government fully understands the sentiments expressed by the Core Committee of the Nagaland Tribal Hohos and Civil Organisations (CCNTHCO) but “election boycott is not the solution”. 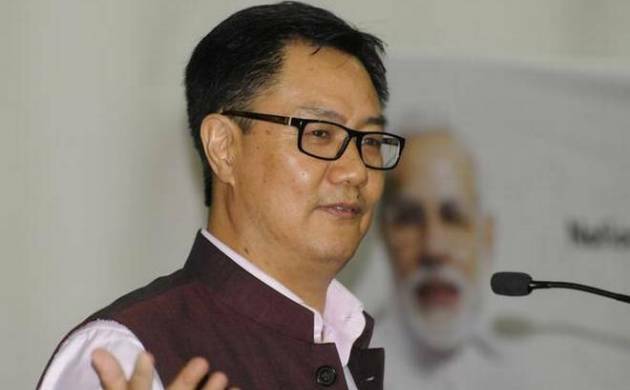 Elections are a constitutional process and the Central government is bound by the Constitution, Union minister Kiren Rijiju said on Tuseday, a day after all parties in Nagaland decided not to contest the February 27 polls. The union minister of state for home, who put out a series of tweets, said the government attaches utmost importance to the long pending Naga issue. “Holding of timely election is a constitutional process. The central government is bound by the Constitution,” he said. Rijiju is also BJP’s election in-charge for Nagaland. His comments come after all parties in Nagaland, including the ruling Naga People’s Front, on Wednesday decided not to contest the elections, agreeing to the demand of tribal bodies and civil society groups that the Naga political problem be resolved first. “Let’s have faith in Prime Minister Narendra Modi ji’s commitment. Govt of India attaches utmost importance to the long pending Naga issue. We believe that peaceful election in Nagaland will facilitate the ongoing peace talks and strengthen our commitment,” he said. The Naga People’s Front, Congress, BJP, Nationalist Democratic Peoples’ Party, Nagaland Congress, United Nagaland Democratic Party, Aam Admi Party, National Congress Party, Lok Jan Party, Janata Dal (United) and National People’s Party were part of the decision not to contest the polls. The National Socialist Council of Nagaland (Isak-Muivah) and the working committee of six Naga nationalist political groups were in attendance at the meeting. The BJP, however, suspended two leaders who had represented the party at the meeting and signed the “no- election” joint declaration, stating they were not authorised to sign or speak without a directive from the party’s central leadership. The Core Committee has called for a total shutdown on February 1, when filing of nomination begins. The Naga Hoho, an apex Naga tribal body, earlier this month sought the prime minister’s help in postponing the elections, saying the vexed issue should be resolved first. Civil society groups in Nagaland have also launched a campaign ‘Solution before Election’. Expectations for lasting peace soared in Nagaland, which had been hit by insurgency for decades, after the Centre and the NSCN-IM signed a framework agreement in 2015. The NSCN-IM has been engaged in peace talks with the interlocutor of the central government since 1997, when it announced a ceasefire agreement after a bloody insurgency movement which started in Nagaland soon after the country’s independence. During a visit to the state in November 2017, President Ram Nath Kovind had said the state was at the threshold of making history as a final agreement on the Naga political issue would soon be arrived at and lasting peace achieved.